I titled the log “Jiggity-jog” because I didn’t want to write “Home Again, Home Again” again . . . and besides, I knew you would fill in the words with the prompt. We have been to Boston and home again too many times in the past six weeks, but Mark is almost finished with his radiation treatments. Monday will be the last one and we will celebrate!!! We just got home because we offered to babysit for Heather and Jed tonight while they went to a friend’s birthday party. It is after midnight, way past time to go to bed, so I’m making this log short. We had a good day. Mark is feeling okay, not great, but good enough. The weather is still beautiful, but cooling off quickly. We might have our first frost this weekend. And we really enjoyed seeing the boys tonight. Heather has to be out of town tomorrow and it is soccer Saturday, so Mark and I will help Jed with child watch while he coaches the two soccer teams. As always, we find a way to keep ourselves busy, busy. I drove back to Boston today to be with Mark. These double radiation treatments are zapping his energy, so I wanted to be here to take to him his afternoon treatment. Riding public transportation is great, but not when you aren’t feeling good. We are having a quiet evening and in the morning we will clean the apartment in preparation of Mark moving out. He will return to Boston on Monday for his last treatments. Hurry! And then we will get down to the serious business of figuring out when we can sail south. Right now the weather next week is not encouraging. The forecast at this time looks like there might be favorable winds on Friday and no wind on Saturday, but then on Sunday the wind once again comes from the south. We could take the two day window and get to the Delaware Bay, but that would not be our first choice. But if the forecast for the following week looks no better, we might have to take what we get. Today was one of my granola making days. I went to Heather’s to use her oven and will return in the morning to complete the job. Then I’m off to Boston. I will get there in time to take Mark to his afternoon radiation treatment. I’ll spend the night and help Mark with the required cleaning of his apartment before he checks out on Friday afternoon. We’ll both return to the Cape for the weekend and commute to Boston on Monday and Tuesday for more medical appointments. At that point, we’ll be looking for that window of opportunity to sail south. Lots to do between now and then–busy days ahead. This log says it is Day 368 of Year 10 in the Voyage of Windbird. I don’t know about you, but the last time I checked on the number of days in a year it was 365 or 366 in a leap year. But my log years represent cruising seasons, not actual calendar years. This year, Year 10, will end when we sail out of Quissett Harbor to go south for the winter. We’re hoping that will be sometime late next week. All we need is three days of gentle winds from the north to get us safely to Norfolk. So we just have to be patient. If we’re really lucky, we will be able to leave next Wednesday or Thursday and the number of days in this cruising year will be 376 or 377. But if next week doesn’t work, our departure date needs to be sometime before the end of the month. The weather watch is on. The rain this morning was torrential and it delayed our planned trip to the dock to fill Windbird’s water tanks. But as predicted by Weather Underground, at 10 am the rains slacked off and we were able to leave the mooring and head to the dock. We took full advantage of being tied to the dock. Not only did we fill the water tanks, but Mary Ellen and Lee got off with their things, we off loaded our kayak and generator for winter storage, and we loaded on cases of beer for our passage south. So most of the heavy work in preparation of leaving is done. I’m sure we’ll find other things we need to offload and others that we want to bring onboard, but we at least have a good start. Mark and I took Windbird back out to the mooring and then I took Mark to shore. He left with Mary Ellen and Lee for Boston. Lee and ME are staying at the Hope Lodge with Mark tonight and tomorrow they will continue their fall road trip—next stop Buffalo, New York. We had a wonderful visit with them and hope to see them again this winter when we are in Florida. After they left, I drove to storage to get the kayak and generator located in their winter home and then I went to Heather and Jed’s to do some laundry. I was really headed to the laundromat near their home, but when I got there I found that it is closed for renovations. The advantage of going to the laundromat is that everything can be washed at the same time. But since that wasn’t possible, I did as much as I could at Heather’s and will continue tomorrow. And since I was ‘in the neighborhood’ Heather asked me to pick Sam and Jonah up from school. In the early evening I met Bob and Beth Lux for dinner in downtown Falmouth. They are yacht club friends from Concord, New Hampshire, who have had their sailboat in Quissett Harbor since mid-August. We went to the Mexican restaurant in downtown Falmouth and had a great dinner. They are here to sail Rhodora across Buzzards Bay for winter storage. We didn’t talk about their plans for next summer, but it would be great if they came back here as it is so nice to have cruising friends in the harbor. What a beautiful day for a day trip to Martha’s Vineyard. There was not a cloud in the sky and the temperature was near 70 degrees with just a gentle breeze. It was perfect for the ferry ride over and back. We arrived in Oak Bluffs, bought a $5 (senior citizen price) all day bus ticket and took a walk through Wesleyan Grove. Shortly after the Civil War, this area became the summer meeting ground for open-air Christian revivals. People came to the island from the mainland and stayed dormitory style in large tents known as society tents. Eventually the tents were placed on wooden platforms and then small gingerbread cottages were built on the platforms around the central open-air church tabernacle. The cottages are charming and it is delightful to walk amongst them. 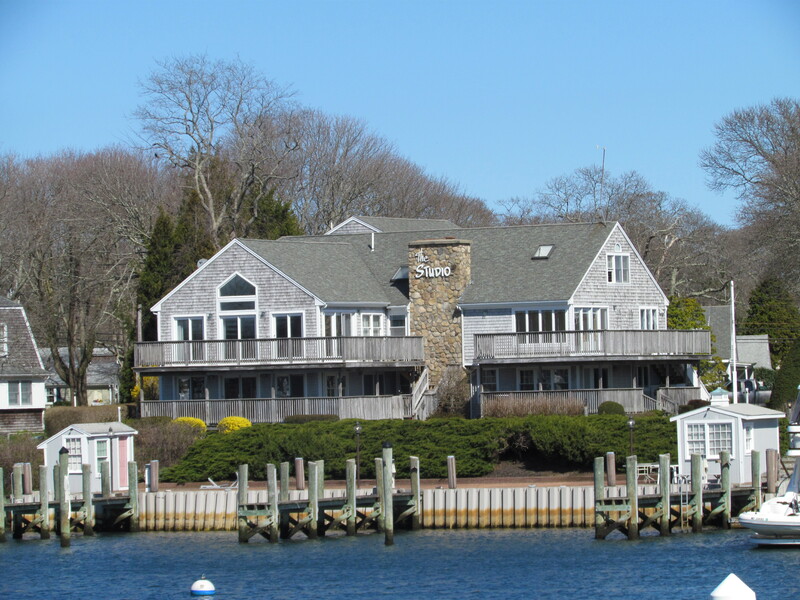 After our gingerbread cottage tour, we hopped on a bus and went to Edgartown. There we visited some of the major historical sites and had a great lunch on the waterfront at The Sea Shanty. From Edgartown on the eastern end of the island, we rode on the bus to the far western end to what was once known as Gay Head. 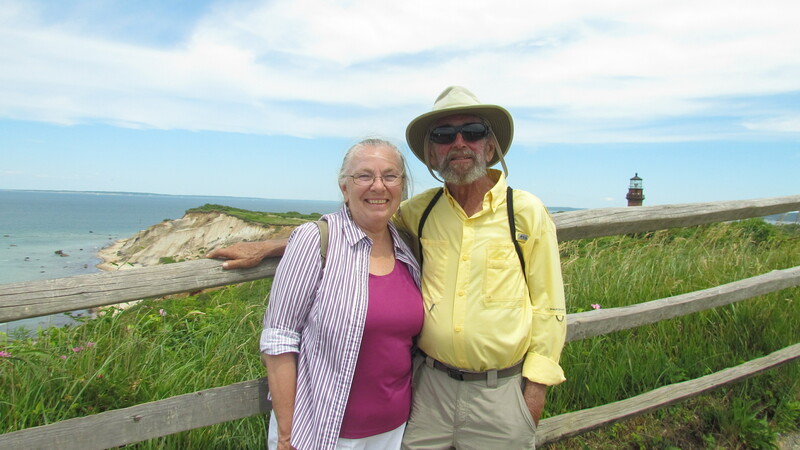 The area is now renamed Aquinnah after its Native American origins–land of the Wampanoag tribe of Aquinnah. The clay cliffs that lead down to the ocean are quite dramatic but we really didn’t have time to get off the bus and explore. Mark and Lee made a mad dash out to the viewing area and then back to the bus just in time for departure. We ended our day in Vineyard Haven and celebrated the gorgeous weather and lovely day of exploring by having ice cream cones. 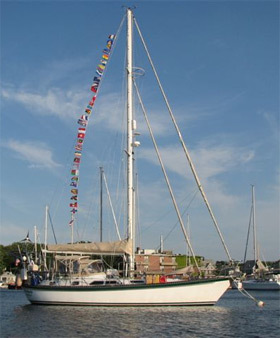 We were back in Woods Hole by 5:45 pm and spent the rest of the evening on Windbird. I received a multi-media text message from Jed while we were having lunch. It was a photo of the boys playing on the beach in Quissett Harbor with Windbird as their background. There was no school today, so they enjoyed a beach day. Heather is still in Boston at a conference, so Jed was a single dad today. Obviously the boys were enjoying their day off school with one last summer of 2015 beach excursion. Tomorrow morning our plan is to take Windbird to the dock to fill up with water. After that, Mark, Lee, and Mary Ellen will take off for Boston. They all plan to walk part of Boston’s Freedom Trail in the early afternoon and then get Mark to Mass General for his 3:30 pm radiation treatment. After that they will all head to the Hope Lodge for night. Lee is a huge Cubs fan and they won another game in the five-game series against the St. Louis Cardinals tonight. The next game is at 4:30 pm tomorrow and they hope to get to the Hope Lodge in time to watch the game. I’ll be staying here, rooting for the Cubs, and getting back to the preparations for our upcoming sail south. Today was a low-key, lovely day. 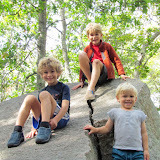 We met Heather, Jed, and boys in Woods Hole for breakfast at The Fishmonger Café and then we all went to the Highfield Hall and Gardens in Falmouth for a walk in Beebe Woods. Highfield Hall is where we went this summer to see the fairy houses. Most of those are gone now as it was just a summer display, but we really enjoyed our walk through the woods. Sam and Jonah were just glad to be out frolicking in the woods. Ollie was especially interested in all of the different toadstools and was convinced that fairies live under the big round umbrella tops. The boys took off on a path and we followed hoping it would circle and come back to Highfield Hall. And thankfully, it did. Sam, Jonah, and Ollie have all really enjoyed spending time with Uncle Lee and Aunt Mary Ellen and this walk gave them more time to get to know each other better. Sam took my camera again today and got some wonderful photos. He is very good at zooming in to get close shots. Yesterday he got some great photos of Jonah playing soccer. 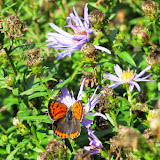 Today he was able to get a close shot of a very small butterfly that I have now identified as a small copper, American copper, or common copper (Lycaena phlaeas). 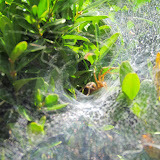 And then he worked very hard at trying to capture the photo of a very fast moving spider that hides in a funnel-shaped indentation on one side of a flat web that lies on the top of low shrubs. I’m not sure of the name of the spider, but I’m thinking it might be in the Agelenidae family. 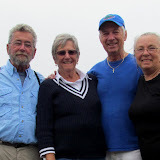 After our walk in the woods, Mark, Lee, Mary Ellen, and I returned to Windbird to spend a lazy afternoon. Mark and Lee sat in the sunny cockpit and soaked in the warmth while Mary Ellen rested and I cooked Southwest Bean Soup for dinner. I also got a chance to look at the photos from yesterday and today. 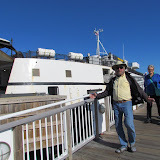 Tomorrow we will take the ferry to Martha’s Vineyard. The weather is supposed to be warmer than today and even sunnier, so we are looking forward to that adventure.